One day last summer I was making myself Sarah Fragoso’s salmon cakes for myself for lunch. Charlotte was paying careful attention, noticing the pink colored salmon flesh (her favorite color) and liking the word “cake” in the name of a lunch item. I was shocked when she asked for a bite and then another bite, and I was overjoyed when she requested them for lunch the next day. It was great timing. I had just about how great omega 3 fatty acids, like the ones found in salmon, are for the brains of individuals with ASDs in the amazing book The Autism Revolution. Her love of salmon in cake form has not faltered. I pack them chilled in her school lunch a few times per week, drizzled with olive oil and lemon. Her teachers often remark how much she loves them. I shake my head in bewilderment, explaining that it’s like winning a Paleo lottery to have a child that loves such a nutrient dense food. In an effort to keep her coming back for more and increasing the nutrient density of the food item, I decided to look at using fresh ginger instead of powdered ginger as one of the spices. When I saw this item in the grocery store, I recognized a local brand and tossed it in my cart. 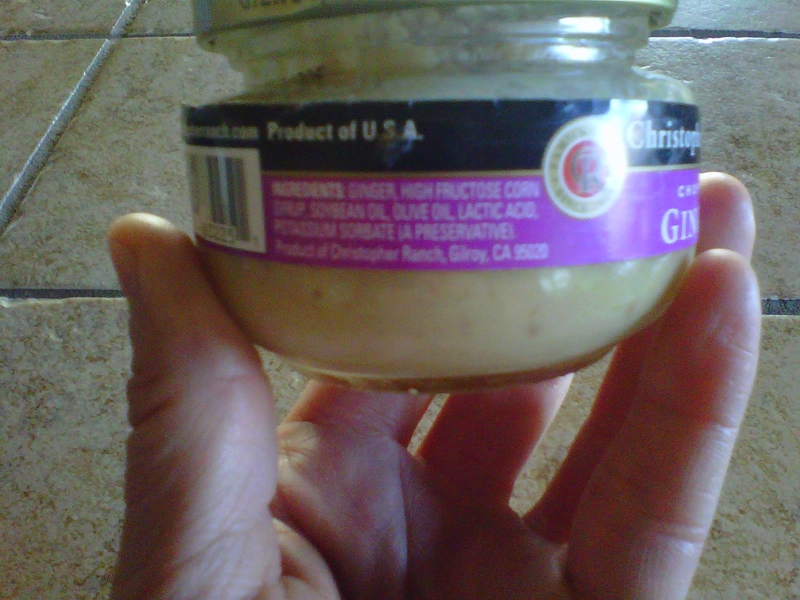 It may be hard to read, but the ingredients for the “ginger” are as follows: ginger, high fructose corn syrup, soybean oil, olive oil, lactic acid, and potassium sorbate (a preservative). 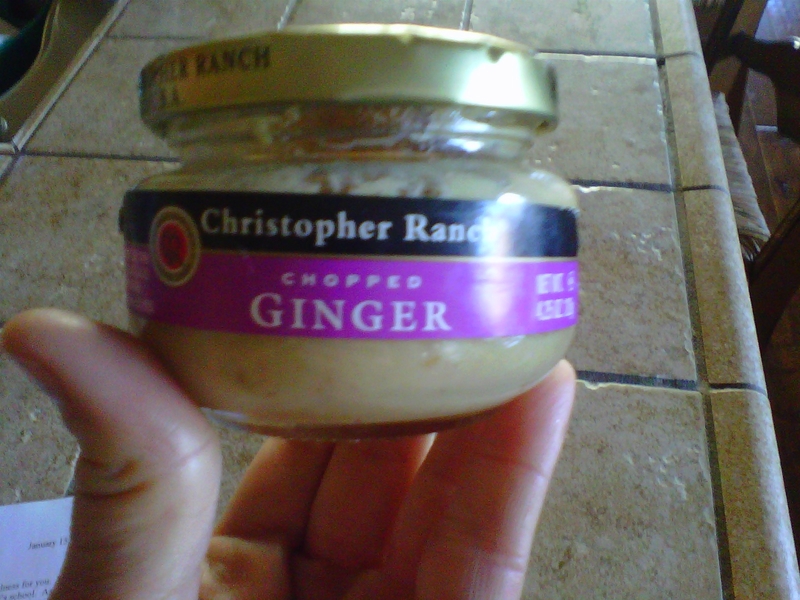 I had mindlessly believed that the only ingredient in ginger would be–ginger. When I really thought about it, I can see the need to add oils for the texture and preservatives to keep it from spoiling, but the high fructose corn syrup as the second ingredient gave way to a massive palm to the forehead on my part. Instead of beating myself up about screwing up such a perfect food with a processed sweetener, I used it as learning experience to be better about reading labels. I was recently asked about shopping for Paleo foods in the grocery store, and after my ginger debacle, I can certainly relate to feeling stressed and overwhelmed at the thought of buying food for your family. I thought it would helpful to share how I try to avoid the traps of deceptive marketing and overbuying. Have a list. I’ve written before about the importance of meal planning and preparation when living a Paleo lifestyle. Other shoppers in the store often do a double take at my legal sized pad full of lists sitting in my cart when I’m shopping. While I squirm with embarrassment and try to get a tough skin for being different, I just have found no other way to do it. Planning meals ahead of time and shopping just for those items saves time and money. I recently came across this site that may be helpful for building meals around proteins and other ingredients you may need to cook in your fridge or freezer. Also, watching the grocery store print ads and knowing which meats are on sale is helpful for meal planning on a budget. Shop alone. As much as I would love to spend my “free time” doing something other than grocery shopping every Friday morning, I know that this is the best time for me. Bringing the kids and husband is a recipe for disaster–more time spent in the store plus more impulsive purchases equals more money spent. Taking the time to read ingredients and using will power to avoid foods you don’t need takes focus, energy, and space. I know many friends who grocery shop at night after the kids go to bed. Avoid the aisles. Almost every ingredient that it takes to make a healthy Paleo meal can be found around the edge of the grocery store–meat, fish, butter, eggs, and sometimes produce are placed in the back of most stores. They’re there for a reason. Store owners are hoping you throw items like soda, goldfish crackers, peanut butter, and cereal in your cart on your way to get to the reason you came to the store in the first place–milk, eggs, or fresh fruit. Most of the items in the aisles of the grocery store are modern Neolithic foods that we’ve become addicted to. Most have gluten, modified food starches, artificial colors or flavors, stabilizers, and added sugars. Our bodies don’t recognize these items as food and disease in some form or another seems to be a result of consuming too much of them. If you’re spending the bulk of your time at the grocery store in the produce section, you’re doing it right. Other than the sneaky ginger item, everything in that section is safe to eat. Try not to be intimidated by nutrient-rich veggies like kale, chard, and beets. A quick Google search with the veggie you’ve purchased and the word Paleo is sure to bring up a delicious recipe. Also, look for creative options in the value-added sections of produce. If you know you’re pressed for time when cooking on a particular night, choose pre-cut fruits and veggies for versatility and convenience. 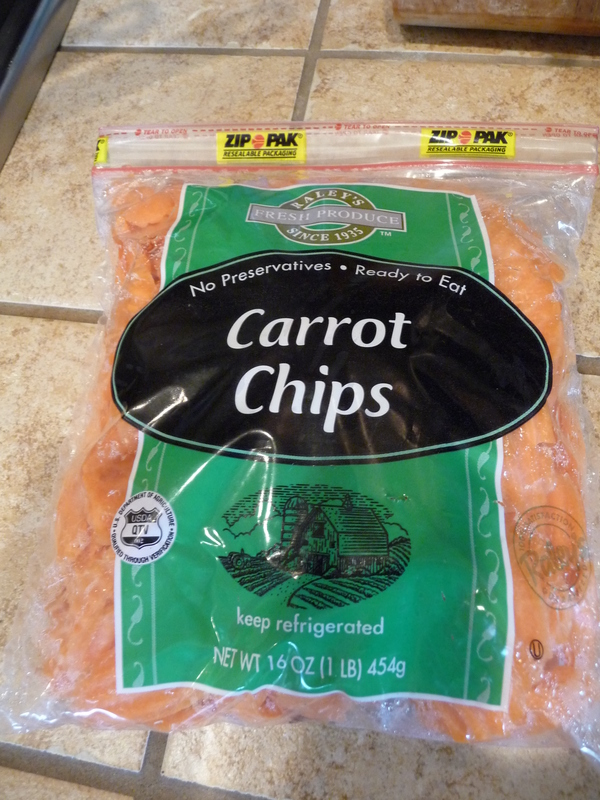 One of my weekly staples is the carrot chips (under $2)–easily boiled for a dinner side dish or dipped in guacamole instead of a corn chip. Keeping focused on the fresh items at the edges of the store is a strategy I still use when I shop. In my experience, the set up of the store is the same for most retail grocers–Costco, Trader Joe’s, or our local supermercado. Nevertheless, I often find myself browsing the aisles looking for a new magical or mysterious packaged item that will make my life easier, and I have yet to find it. (If you’ve found a gem in the aisles of the store, share it in the comments below). For the most part, Paleo is about shopping for basic ingredients and using them to put together deliciously homemade meals. If you haven’t been told yet, you’ll need to learn how to shop differently and cook real foods to find success with this lifestyle. That being said, Paleo moms and dads are armed with awesome resources to produce these meals for their families. Use the Paleo community tab to find a Paleo recipe blog or cookbook that fits your style. What you’ll notice is that the ingredients are simple and pretty easy to prepare. It takes some practice but after a while when you slip into a grocery store aisle to grab canned coconut milk or almond flour, you’ll slip out just as quickly knowing that there’s nothing in the packaged foods that is of any benefit to you or your kids. It takes a smart and savvy consumer to beat the big food business. Being prepared and staying focused on your family’s health is sure to help on your next grocery store adventure. This entry was posted in Budget, Meals by peacelovepaleo. Bookmark the permalink. Thank you, Rachel! Let me know how you like that website.